I have a slight obsession with makeup brushes, I admit. In fact, I think that if money were no object, brushes would be the biggest part of my makeup collection. 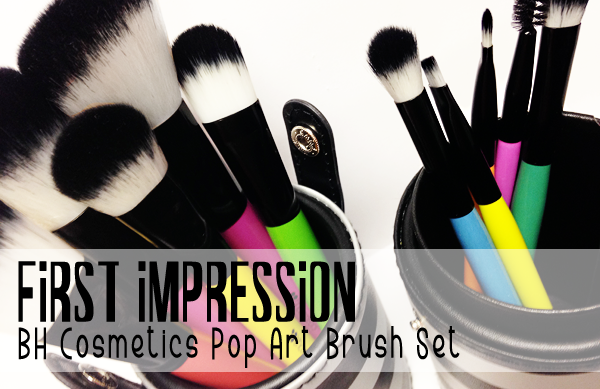 Alas, I need to think about spending when it comes to things like this so I love a low cost set of brushes. Of course, when it comes to brushes I think it's usually pretty fair to say that you get what you pay for, with a few exceptions. Still, I've actually been lusting after this particular brush set for a while. I can't help it, it has insane rainbow handles and it comes in a stripey tube. I love stripey tubes. What is my brain. Moving on. Keep reading for more of my thoughts. Stripey tube. Now, I'm sure everyone has seen the tubes that several of the Sigma brush sets come in and this is pretty much a direct rip off of those. I don't have any Sigma brush sets (yet!) but that was always one thing that always drew me to them. I feel like this is going to be really handy for me, since I'm actually really often carrying around a brush set and this will do a good job of protecting them. And it's a stripey tube. We like stripey tubes. These tubes are actually really handy because they become brush cups when you separate them and can be placed on your vanity or put together for travel. 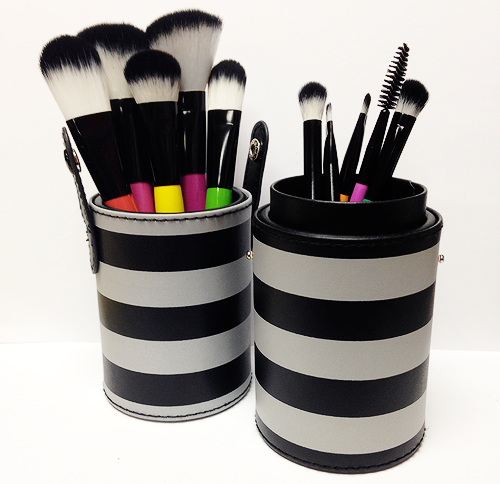 Multipurpose brush storage is always a good thing, in my opinion. Now, when these arrived and I opened the tube, I got a whiff of a distinct paint-like smell. I wish I could say that I was surprised by this, but I actually was kind of expecting it. After giving the brushes a good close up sniff, I can say pretty certainly that what causes the smell is the glue that's holding the bristles into the ferrule and it really only seems to be the two bigger brushes that smell. As well as being the source of the paint smell, these two brushes are the only two in the set that were shedding when I received them, but I'm not sure if they will continue to shed in the future. Each brush has a different coloured handle, which I think makes this set really cute and fun, but I wish that the brushes were printed with the name of each brush. I always feel like that's a nice addition to any brush, even if you aren't going to use it for its intended purpose. 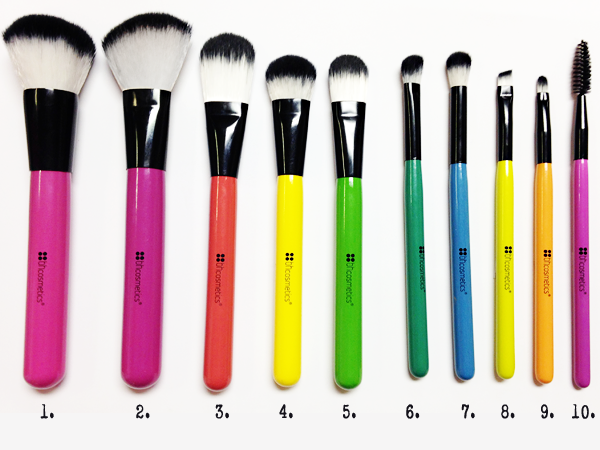 All of these brushes have very soft, synthetic bristles that are pure white at the base and black at the tips. 1. Powder Brush - This brush has quite short bristles that are fairly densely packed. Because of this, I would say that this would be best used to apply a loose powder foundation, such as a mineral foundation, rather than applying other powder products. I think that it would deposit more product that one might want with a finishing powder, a bronzer or a blush. 2. Angled Powder Brush - Because this brush is quite pinched at the base, I think that this will be a perfect blush for applying highlight and contour since it has the ability to cover a good amount of area while still being somewhat precise. Also, the bristles on this brush are not as tightly packed which gives this a fluffier feel that I think would apply just the right amount of product. 3. Foundation Brush - This brush is a fairly standard flat foundation brush. I feel like the density and flex are probably good for applying liquid foundations, but I can't say with much certainty since I actually really don't like to use this kind of brush for my foundation. 4. Complexion Blending Brush - This is one of the three brushes in this set that I'm really excited about. For a face brush, it's actually quite small, but I think that's what excites me about it. This actually feels to me like a smaller version of the Real Techniques Expert Face Brush, which is actually probably my favorite brush in my collection. I think this will be good for more precise buffing on the skin, such as blending out concealer. 5. Flat Complexion Brush - This is the Mini-Me of the Foundation brush, and again this isn't my favorite type of brush to use. However, I do like to use brushes like this to apply cream highlights so I think it'll get some use. Sometime. 6. Fluffy Angled Eyeshadow Brush - This is the second of the three brushes that I'm really excited about. While this brush is fluffy, it's still fairly small and I feel like it will do a good job of applying and blending out a transition shade on the lid, which is sometimes a bit of a chore for me because of my eye shape. 7. Tapered Eyeshadow Blending Brush - And the third of the brushes that cause me excitement is this one. I love a fluffy tapered blending brush, I really do, but they can be hard to find and also... not good. I have two in my collection that I use fairly regularly, but both are bigger than this one. I think this will be good, again, for applying crease shades in my weirdly shaped eyes without blending things out too far. 8. Angled Liner/Brow Brush - This brush is very, very small. And as far as I'm concerned, that's a very, very good thing. I love really small, thin angled brushes because I feel like they're really good for pushing liner right in against the upper lash line or really defining your eyebrows without going crazy. This seems like a good one as it is nice and firm. 9. Lip Brush - This is a pretty standard lip brush, which also reminds me of the Real Techniques lip brush. I don't really use lip brushes either, even though I should more because they're really precise. Anyway, this seems good. 10. Spooley Brush - It's weird to have anything to say about a spooley, but... This one looks really standard and I've never really had anything to say about different spooleys (other than the ones that come on the end of a brow product, which are not all created equal) this one actually feels really soft and I feel like I'll actually enjoy brushing out my brows with it. Random. 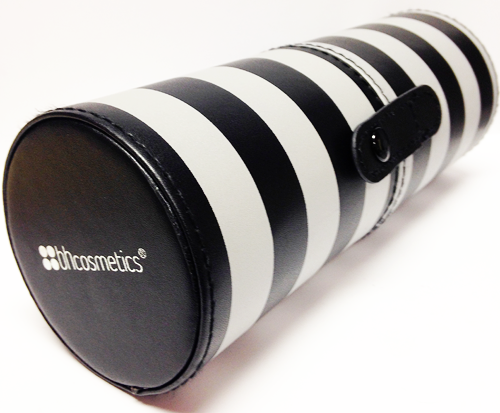 However, you can't store it in the tube with the other brushes because it catches bristles and pulls them. Overall... I feel like this is a pretty good brush set for the price. (Original Price: $24.95, but it is literally always on some kind of sale and I think sometimes you can get it for around $10.) I love the stripey tube, I'm a little disappointed with the bigger brushes, there's a few brushes that I just don't love because of personal brush preference, and there are a solid three that I'm really excited to work with. I would recommend this set to anyone brush obsessed and on a budget or to young women/girls just getting started in makeup.